Hyperbole: An expression that exaggerates, or describes something as greatly magnified or diminished beyond the strict line of truth. 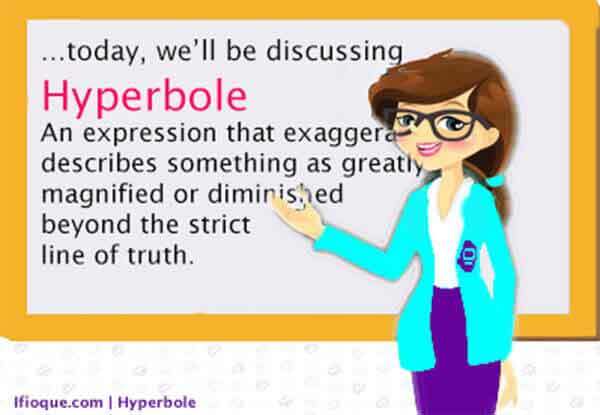 Hyperbole is an excessive exaggerationOpens in new window, an expression that exaggerates, or describes something as greatly magnified or diminished beyond the strict line of truthOpens in new window. In other words, hyperbole magnifiesOpens in new window or diminishesOpens in new window the significanceOpens in new window of something to a disproportioned degree than it really is, and could not actually be true. The key component that makes hyperbole effective is that part of truth; Hyperboles must be founded on elements of truth to achieve its aim, and at the same time be meaningful. For example, If I say, “I’m so tired I could sleep for a week,” I am using a hyperbole. I’m not in a coma, and I couldn’t possibly sleep for a week, but the connection correlates. The truth lies in the extent of the tiredness. It’s an exaggeration, but it’s based in truth. These two divisions of Hyperboles can be expressed in a variety of ways, as the following headings show. And on its top recline the weary stars. Enormous battle on th’afflicted deep. Another significant variety of expressing an Hyperbole is the use of a strong Metaphor. This variety may consists when we call a very virtuous character “an angel,” and a very vicious one, “a fiend” or “devil”. As we may say a drunkard is “a swine,” and an extortioner “a wolf” or “barpy”. It appears that when Hyperbole is expressed by a strong Metaphor, as in the third case, it is rather to be considered as a particular species of the MetaphorOpens in new window than a distinct and particular kind of trope. Dr. WardOpens in new window, in his “System of Oratory (vol.ii. p. 24), observes, that an Hyperbole is principally metaphorical, but sometimes taken from other tropes; as when instead of saying Cato was a very virtuous man, Velleius Paterculus calls him the image of virtue, it is an hyperbolical MetonymyOpens in new window of the adjunctOpens in new window for the subject. The structure of the hyperbole tends to lie in the difficulty of conveying to others the ardor and extent of our ideas, and therefore we venture beyond the boundaries of truth, that the mind of the hearer without any further labour may reach as far as the truth at once. In this vein, QuintilianOpens in new window notes: “We are allowed to speak beyond the truth, becaue we cannot exactly strike upon the truth; and it is better we should go beyond, than not attain the truth in our discourses”. The Hyperbole is one of the greatest freedoms in all language. It is a most exquisite, elevated, and impassioned form of speech. Like a flame from a strong internal fire, it breaks out at once into a blaze, and mounts with an irresistible power and rapidity to heaven itself. If she stops loving me, I’l stop breathing. Her legs are so tiny like those of a mosquito. Alex’s new car moves as fast as the speed of light. She’s older than the hills. I've seen the movie a million times. I was so exhausted that I could have been knocked over with a feather. In sum, Hyperboles add vibranceOpens in new window, amusementOpens in new window, and styleOpens in new window to a statement, and are not used in non–fiction works unless the writings are of a humorous nature. They would not be used in research works or medical journals. Hyperboles are ideal for fictional writingOpens in new window where the author wants to add humor to the writing or add substance to the characters. As earlier emphasized, Hyperboles are also used via comparisonOpens in new window devices like simileOpens in new window and metaphorOpens in new window to make bizarre comparisons that are viewed as ridiculous and exaggerated.